If you are receiving this document it means that somehow you have found me, and I would like to welcome you all into my studio which is focussing on the Accelerated Teaching Method. I would like at this point to take the time to explain why it is successful and how it is different from conservative teaching methods. ACCELERATED TEACHING METHOD~ what is it? This teaching method is based on the premise that making music is more important than learning to read the music. While the conservative method of teaching students to read music as they learn to play is more thorough, it is very slow and all of you know different ones who lost interest in continuing to learn the piano because it was “too hard”. Plus times have changed where children don't want to sit at a piano and learn scales and Sonatinas....they now want to “do it now”, not to have to wait for years before they can play well, and play music they know. My method is based on the Suzuki method, where students are taught using a numbering system~ but I have taken the method to another level where I teach reading notes through card games and then exercises on the piano. I use a system of playing chords in the left hand which enables students to play two hands from the first lesson. This is very exciting for a beginner! As a student progresses, the numbers are decreased on the printed music, and I revert back to the conservative teaching methods, especially when examinations are introduced. Will my child do piano exams? Only if I feel he or she will benefit. Usually I sit a student for the first Preliminary exam with the AMEB as an introduction to Classical music. It also teaches general knowledge and improves technical skills. However, some students do not have the personality to deal with stress and they do not need to sit for exams to progress. In fact, it is in my experience that exams inhibit sight reading skills because a great deal of time is spent on only a few pieces, cause fatigue and can cause a student to lose their love of playing. 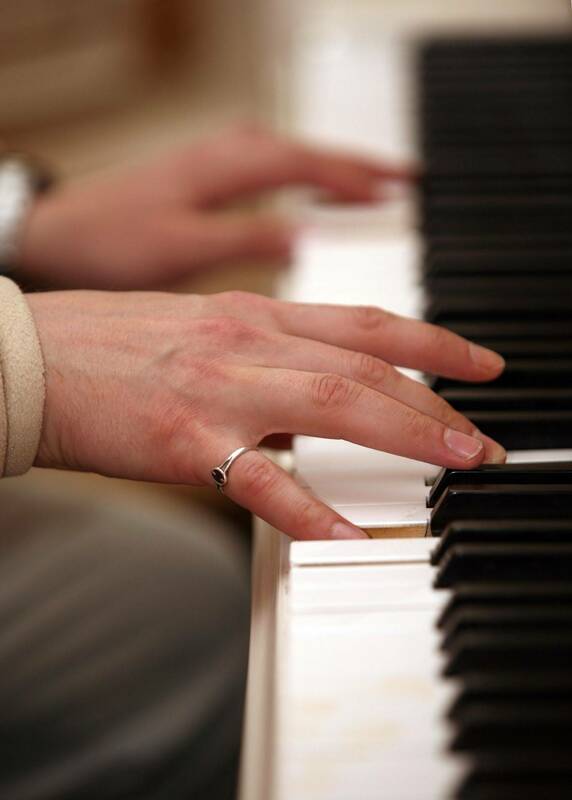 I truly believe that teaching the love of the piano is more important than learning to play it. These students keep playing into their later years and don't give it away. I had many drop outs from other teachers in Canberra and felt that my gift in life was to give them what was missing with their previous teacher....the absolute joy of playing their instrument. In summary, exams for those who want to improve their skills and need goals in their life ~ but not at the expense of losing their joy in their instrument. How much practise does my child need to do? I would hope that the pieces I give your child will make him want to practise! I make an effort to only choose music which he shows interest in. For that reason a lot of my music is sourced from the internet so that he or she is playing the latest songs that they are listening to. This is a cost which I largely absorb, pieces on average cost $6.00 per copy. I do, however, charge a $20 per term surcharge to cover photocopying expenses and the occasional download from the internet. Summarising, children nowadays have busy schedules and are busier than children used to be 50 years ago when the conservative methods worked well. I am not a teacher who expects exclusive devotion. Whatever they can give me, I am happy with, unless there is a pattern of continuing non-practice. In Canberra I let these students go after a warning, because I had such a long waiting list and so many begging me for lessons. If your child is a continuous non practiser, then I will also give your child a warning because I feel that he or she is wasting my time and your money. I think that is fair. Okay, this is where some of you could help me out. A lot of my students are on dodgy keyboards which inhibit their playing and progress. I don't expect any of you to fork out for the latest new piano, but there are good digital pianos out there which will be good for years and don't need tuning. You are spending hard earned money on piano lessons, and it is fair to say that your child will be with me for years. To get the value out of your lessons, make a goal of getting a decent instrument for your home. It will make a real difference to their interest in practising to have something which makes a good sound. It is actually very discouraging for a student to be playing on a bad instrument then come to their lesson on a grand piano. Please bear in mind that the beautiful antique piano you have inherited is a piece of furniture that should be admired but NOT played by a serious student ~ pianos of 100 years and older are ready for a skip, the strings have stretched too much for the piano to hold its tune and the pedals rarely work properly. BTW, children will only be taken through the AMEB exam syllabus if they have a digital piano with weighted keys and a full keyboard, or acoustic piano. The 2018 fee remains at $35 per half hour lesson. This is still way below the Music Teachers Association's recommendation of up to $90 per hour, of which I am a full member. Additionally, as I indicated before, I charge a 'one-off' fee of $80 at the start of Term 1, to cover resource material such as music scores, internet charges and photocopying, or for students starting mid year, $20 per term. Please keep in mind that term fees are in advance, as with any educational institution and should be paid up within 21 days of being given your account. To make sure that you all understand, you all book a place in my studio which cannot be taken by another student if your child misses for some reason. Therefore lessons are non refundable unless I have to miss~ this will be credited to your next term. However, if you give me enough notice I will try and make up the lesson in that week, unless I come to a special arrangement to make it up at a later time because of extenuating circumstances. These are regulations which are followed by the whole piano teaching industry, especially the MTA. Seeing we will have a long term arrangement, I thought it was good to let you get to know a little about me. I was taught by my father who played at concert level, and reached 8th grade by the time I was 12. However, I pursued an art degree in my tertiary years, and specialised in portraiture with scholarships in the Fine Arts. During the years, I married and began a piano teaching studio in the Riverina, basically experimenting on my own talented children. When my children were grown I moved to Canberra and the teaching methods that I had developed through this time~ which were very alternate~ became popular in the city. I also began painting again, and developing my photographic skills. My portraits were finalists in nationwide competitions, even being exhibited in USA. I received a degree in writing music through this time. Teaching piano, however, has been my first love, and meeting people and enjoying children. Because I love the arts, and music and the arts usually go together, I will encourage your child in this area. That we all have a long term friendship, and that you, the parents, can feel free to talk to me about your child's progress. The method is so different that very shy children can gain real confidence in themselves because they can now do something quite special....and I have seen it time after time, a change in their thinking and belief in themselves. When a child does something well, confidence in other areas will be very evident. If I have done nothing else for a child, especially those with confidence issues or limited ability, but give them something that they feel good about, then I have achieved something worthwhile. I also encourage my students in later years to think about teaching the piano, especially girls. I will help them in this. It makes wonderful part time work ~ especially as young mothers at home~ and have seen quite a few of my students over the years being able to make a living for themselves. In the six years I have been teaching in the mountains, my students have had access to a beautiful studio which is also used by the AMEB as an examination venue for all candidates in the Blue Mountains, Lithgow and Penrith area. It is hoped that my studio will be used by the AMEB in Forster but four hours of examining time are needed before an examiner will attend a local studio...so here is a call for serious students who would like to have a go in the future. Until then, who cares? Let's just have fun with our music and enjoy the ride together. Thank you for reading this, and I hope you will now understand more about what I am trying to achieve with your son or daughter, and that you can help them too, by encouraging them and especially listening to them play at home. Looking forward to getting to know all new families!